There's a bit of a tempest at WUWT and Steven Goddard's regarding satellite data on sea ice. And there are some anxious comments about FOIA filings to be made regarding data that's been hidden. I have to concede that it takes a bit of a historian to know what's really being said in the IPCC first report regarding sea ice. (see page 224, figure 7.20 for the source of the tempest.) Fortunately, I am such a historian :-) To give away the ending: There's nothing terribly dramatic going on in the sea ice or the history. But I'll take the chance to talk history of sea ice analysis. "Sea-ice conditions are now reported regularly in marine synoptic observations, as well as by special reconnaissance flights, and coastal radar. Especially importantly, satellite observations have been used to map sea-ice extent routinely since the early 1970s. The American Navy Joint Ice Center has produced weekly charts which have been digitised by NOAA. These data are summarized in figure 7.20 which is based on analyses carried out on a 1 degree latitude by 2.5 degree longitude grid. Sea-ice is defined to be present when its concentration exceeds 10% (Ropelewski, 1983). An additional pointer to the fact that we're not looking at ESMR and SMMR passive microwave sea ice fields is that the figure has data before December 1972, and no break of continuity between October 1976 and October 28, 1978, when there were no passive microwave sea ice data. A major part of the story is that there are satellites other than passive microwave. In particular, satellites that use visible and infrared wavelengths. If you see satellite pictures on the weather section of your TV news, or look to the satellite portion of your phone's weather app, this is what you're looking at. Such instruments go back to the early 1960s, when the first weather satellite TIROS was launched by a friend's grandfather. (Well, other people may have been involved. But he signed my friend's name on the inside of the satellite.) If you look at a (visible or infrared) satellite picture of the polar regions during polar daytime you can typically see the ice pretty well. Ice is very reflective, so looks bright. Unfortunately, so do clouds. So visible and infrared are not easy to use by computer for constructing sea ice cover maps. That's why the Joint Ice Center (JIC) had (and still does, they're now named National Ice Center) people looking at the satellite pictures and trying to decipher which bright spots are clouds and which are sea ice pack. On the other hand, look at the resolution of the gridding. It's about 100 km on a side, versus the 'low' resolution SSMI and SSMIS being 25 km, and the AMSR-E 12.5 km. 1 of the cells on this grid is 64 on the AMSR-E grid! Also remember what technologies were around in the early 1970s. High resolution touch screen computers with Geographic Information Systems it wasn't. Think grease pencils and plastic overlays on map backgrounds. One followup question being to consider why there aren't JIC data before 1972. It is because there wasn't a JIC before 1972. In the first few years of the record, the JIC was learning how to do sea ice analysis. This is not trivial, as the difference in the satellite observations between clouds and sea ice is not always obvious. And, since it was Navy enlisted personnel doing the job, you also have to train up new people to the job regularly. Navy personnel rotate between locations every 2-3 years, taking on and learning new tasks. Now let's go back to a phrase from above that might have slipped past your eyes -- 'polar daytime'. When the sun is up, you can use, if with some difficulty, the visible and infrared satellites to tell what the sea ice cover is like. What do you do, as a sea ice analyst, for the upwards of 6 months of polar night? Curse. Well, make the best use you can of climatology, the few scattered observations of the ice edge you get from ships and planes, and your best educated guesses on how things may have changed since you last saw the ice edge. Of course if you're just getting started on doing the analysis at all, you don't have much of a climatology to work from. And your educated guesses aren't as good as they will be in a year or two, when you have more experience. Which is a different issue on using the JIC analyses. Namely, the analyses cannot be reproduced. Nor can was done then be redone by modern methods with the information of 1972. Even though we've learned a lot in the last 40 years about how to use visible and infrared satellites to analyze sea ice cover, we can't go back and redo the ice analysis of the early 1970s JIC by current standards or algorithms. These facts don't mean that you can't make any use of the JIC analyses. But it does mean that whatever use you make has to be done in awareness of these facts. Goddard's use, picked up by WUWT, is ignoring them. I'm dropping comments at both pointing them here so that they can start making appropriate corrections to their efforts. In the mean time, for the longest self-consistent and reproducible satellite sea ice fields, see ftp://sidads.colorado.edu/pub/DATASETS/nsidc0192_seaice_trends_climo/esmr-smmr-ssmi-merged/ for a merging of the passive microwave satellites 1972-2002. Again, the original and more discussion is at the NSIDC. [Update 17 April 2012] Neither WUWT nor Stephen Goddard made any correction to their erroneous postings, even after I notified them. Thanks for this clarification, Bob. I saw this pop up at Goddard's a while back and didn't really expect Watts to fall for it so unquestioningly, as he is well aware of Goddard's MO (having 'sacked' him twice as a WUWT guest author). But the ice is a problem to some skeptics, and so they'll grasp at anything. Like the famous USS Skate photo (not) at the Pole. The University of Bremen sea ice extent time series (Milke & Heygster) forms a nice record, evidently well harmonized, from January 1972 through October 2011 when AMSR-E died. I'm hoping they will restart it when the next satellite goes up. At the link below (Figure 4) is a graphic comparing the Uni Bremen, NSIDC and Cryosphere today September time series, the UB extending back to 1972. 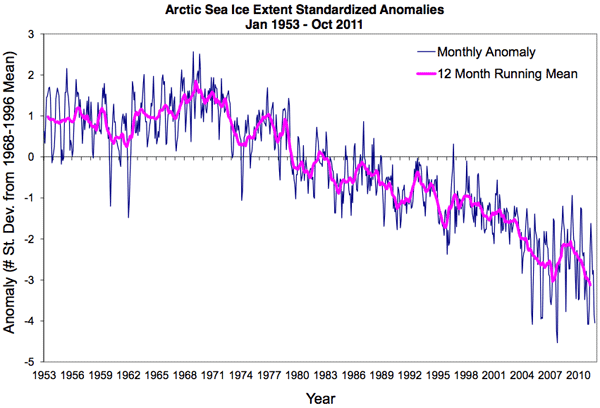 Figure 5 in the same post shows significant declines in all months of the year, 1972-2011. The pseudoskeptics are funny about ice. For years their mantra has been that we know nothing about sea ice before 1979, therefore can't say that 2007 was unusual. (See http://moregrumbinescience.blogspot.com/2009/01/ice-before-1979.html for some reality.) Alternate with newspaper articles they claim 'prove' that ice was just as large/small as now (which would rather disprove that we didn't know what ice was prior to 1979). Now, invent big conspiracy. As usual for scientists, though, the conspiracy is so poorly done that 3 years ago I was writing a post pointing people to sea ice data from before 1979. MMM: I don't really think the problem is one of inability to read graphs. Rather part is, and I have to grant this part, it is hard to do science. Not so much that you have to be 'smart', but that you have to be ready to let go of what you thought was the case before you started studying. If, instead or at least moreso, you are looking for evidence to support a conclusion you already hold, it becomes even easier to see what you want to rather than what is there. Larry: Thanks for the link. I've downloaded the Bremen technical document. My German was never very good and is now about 30 years rusty, so that can be a lot of my problem. The problem is, I can't identify where they are getting their pre-SMMR data from outside the ESMR December 1972-October 1976 span. Some comments seem to be attributing 1972-2002 for ESMR, which can't be right(?). As far as I know, only the one ESMR was flown. Could a German speaker (or at least reader) please follow Larry's link to the Bremen technical report and clarify this? "The pseudoskeptics are funny about ice. For years their mantra has been that we know nothing about sea ice before 1979, therefore can't say that 2007 was unusual." That hasn't been my problem with you. 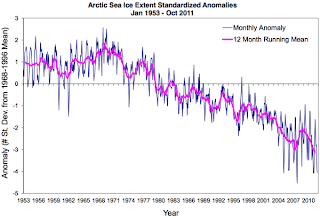 My problem is that you cry about the arctic ice melting but don't say anything about the antartic ice increasing. There is far more ice in antartica and the data on global ice shows that ice extent has been remarkably stable the past 150 years. So I would just say you mislead people and are disingenuous. 3: It isn't unusual for me to mention the Antarctic, and I have a full-length post about the expansion of the Antarctic sea ice -- http://moregrumbinescience.blogspot.com/2010/03/wuwt-trumpets-result-supporting-climate.html Unfortunately for pseudo skeptics, it turns out that expansion of sea ice in the Antarctic was predicted by climate models before it was observed. 4: Source for saying "far more ice in Antarctica" (see also 3, of course, but what makes for _far more_? far more than when?) Source for "the data on global ice shows that ice extent has been remarkably stable the past 150 years."? (what constitutes 'remarkably stable', what would be unremarkably stable? and so on.) None given, as usual. Reminder to anonymous, but more importantly, the real skeptics, is my link policy is to encourage providing links to support scientific statements. take the northern hemisphere sea ice anomaly data from Illinois university and combine it with the southern hemisphere sea ice anomaly data. anonymous: In providing a source, you're supposed to make it possible to get to the place that you are getting your information. This is no Illinois University. There are [Northern, Eastern, Western, Southern, Northeastern] Illinois University, Illinois State University, the University of Illinois -- Urbana-Champaign, and the University of Illinois -- Chicago. Whether you mean one of these or some other, who knows; much less which one of these you mean. I could make some guesses, but guessing doesn't help. I know several Illinoisans who've worked on sea ice, and several different data sets that they've produced over the past 30 years. If you'd provide an actual link to what source you mean, as I suggested to the previous anonymous, then we could have some data to talk about. So much the better if it spanned the 150+ years the previous anonymous referenced. A look at the chart of global ice on Cryosphere Today shows clearly that total world sea ice is in decline.